TACO’s high-gain UHF SATCOM antenna is designed for rapid deployment communications. The SAT-MP-320 covers the entire frequency band of 240MHz to 400MHz, with a peak gain of 11dBi. This single piece, foldable antenna and tripod unit deploys with three easy steps in less than 30 seconds, with no additional parts. 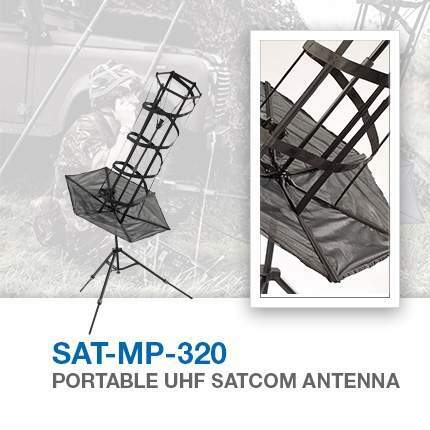 Built to military standards, this rugged yet small antenna includes a durable nylon carrying bag. Its cam lock style tripod leg length adjustment makes for easy setup on uneven terrain. 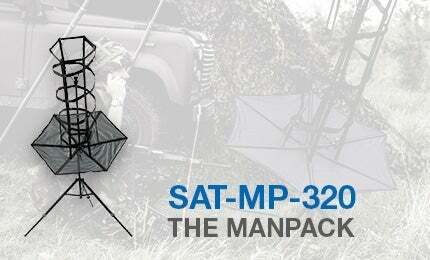 The SAT-MP-320 Portable Helical is extremely compact, light and has excellent portability. Its compactness allows for better deployment options. Tent pegs are also included for added tripod stabilisation. 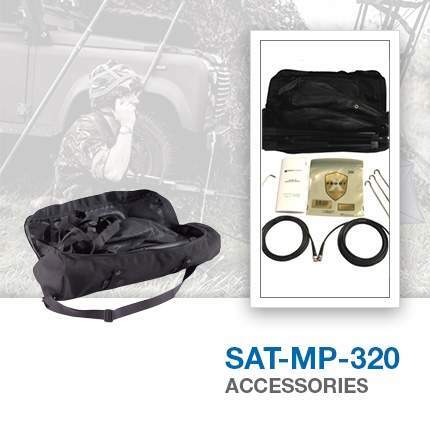 Our SAT-MP-320 Portable Helical is less expensive than comparable competitor options. Its top quality, ultra-flexible cable minimises loss by 1dB. It also features high gain throughout the 240MHz to 400MHz frequency with no additional parts. The single azimuth / elevation cam lock handle allows for smooth and intuitive pointing adjustments. The self-deploying ridged RF connection interface omits connection failures associated to pigtail connections. The Portable Helical’s storage bag mounts easily to the tripod base acting as a vessel for the addition of ballast. The storage bag is also equipped with MOLLE straps, allowing for mounting to tactical vest and related mounting interface. This product is approved for use by the US Army and Navy, and is UFO and MUOS compatible.